The Procurement Regulations for Borrowers as part of the Bank’s New Procurement Framework include more than 100 pages and yet, 5 lines make a big difference: Borrowers may utilize electronic systems for distributing Procurement Documents, issuing amendments, receiving bids or proposals and for other procurement actions, provided the Bank is satisfied with the adequacy of the system, including, the system’s accessibility, security and integrity, and confidentiality as well as audit trail features. E-Procurement provides the benefits of increased transparency, efficiency, and competition. With over 270 active IPF projects in ECA totaling more than $26 billion, a rather conservative average savings of 5% would still amount to $1.3 billion. E-Procurement reduces the opportunity of fraud and corruption due to better compliance and less human interference. E-Procurement ensures the availability of data in electronic format to strengthen procurement and contract management by making informed decisions based on relevant data analytics. ECA SIP has adopted an E-Procurement Strategy which includes the objective of increasing the use of e-Procurement in Bank funded operations. In helping develop acceptable country e-Procurement systems, ECA SIP aims at promoting e-Procurement as first step in using Alternative Procurement Arrangements. E-Procurement systems in ECA countries have been assessed and approved for use in Bank operations with or without modifications and the availability of Bank project procurement data in electronic format will be analyzed to identify opportunities for better project results. 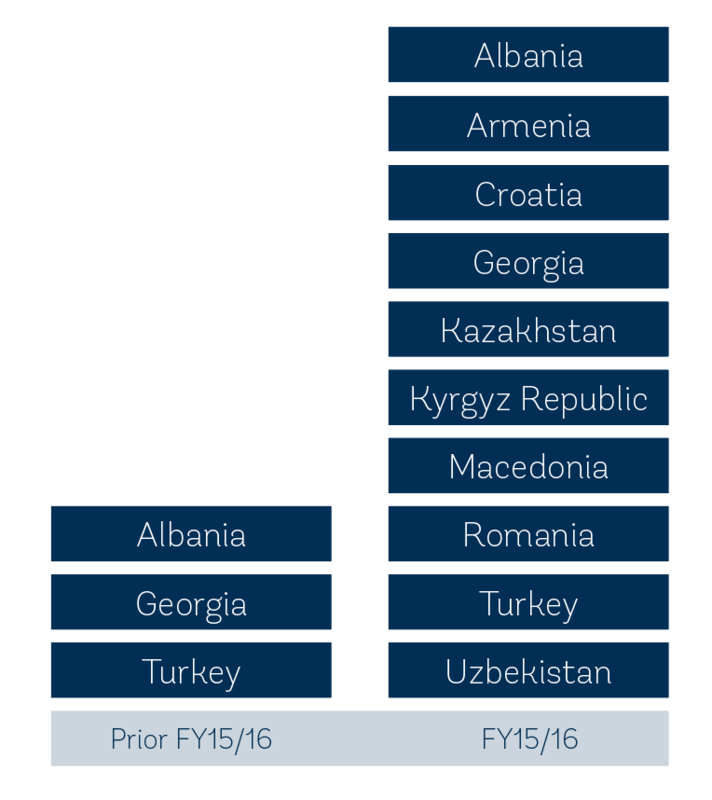 The following chart shows the increase in the number of ECA countries whose e-Procurement systems were assessed and approved for use in Bank funded operations in FY16. Other highlights of ECA SIP’s E-Procurement activities in FY16 include the International E-Procurement Forum “Enhancing Public Spending using E-Procurement Data” held in Vienna, Austria, December 1-3, 2015, with 80 procurement professionals from 30 countries and 8 international partner organizations (click here for more information); the development of the first public procurement online learning and certification program in Kyrgyz Republic; E-Procurement implementation support in Kosovo and Tajikistan; procurement data analytics in Albania and Georgia; and many capacity development initiatives such as virtual forums on selected E-Procurement topics with all ECA clients. Moving forward, ECA SIP will extend the use of E-Procurement throughout the ECA project portfolio in line with the new procurement methods and approaches of the New Procurement Framework. This will result in the availability of data for benchmarking the procurement performance and results in Bank funded operations on a regular basis. This is how the five lines in the Bank’s New Procurement Framework add big value to the Bank’s investment operations.